In large skillet, warm olive oil over medium heat. Add garlic and cook 1 minute (making sure it doesn't brown). Add spinach to pan and cook until wilted, approximately 2-3 minutes. Mix in the cheeses and stir until melted. Season with salt and pepper and remove from heat. To assemble quesadillas, use 2 tortillas per quesadilla. Take first tortilla and place flat on surface, spread 1/4 cup of spinach mixture, top with 1-2 slices of chicken breast and cover with second tortilla. Brush lightly with softened butter. Repeat with next 6 tortillas. Heat large skillet or griddle over medium heat. 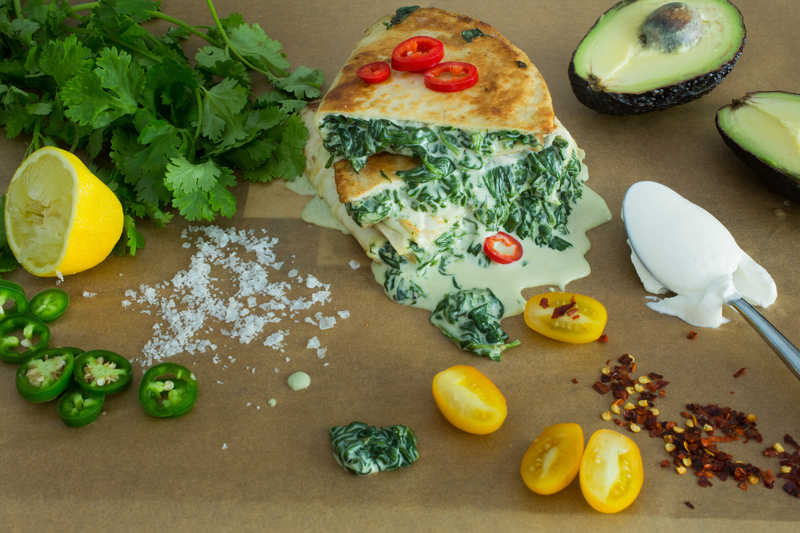 Grill quesadillas 1-2 minutes per side until golden brown. Transfer to cutting board and cut each quesadilla in four wedges. Serve with topping of choice. Enjoy! *oozing cheese sauce in picture was for photo shoot purpose only.